An awesome line of shreddable, foraging and fun toys! The four clear acrylic cups cups will dangle and dance as your bird attempts to retrieve its treats. Great foraging starter toy. Approximately 12" x 7" x 7"
Awesome for medium birds to larger birds who are not aggressive chewers! Hangs from both sides. 29" long and weighs almost 3 pounds! The Super BirdMini Activity Wall enriches your bird with climbing levels, natural textures, and color variety. Made from a natural seagrass frame chock full of toys. Check out our toy parts to add your own toys! Mini Activity Wall is made of seagrass, plastic toy pieces, vine chain and shoelaces. This multitude of textures extends your bird's playtime and shredding satisfaction. Safe and nontoxic. Ideal for parakeets to conures. 8" x 2" x 10" high. 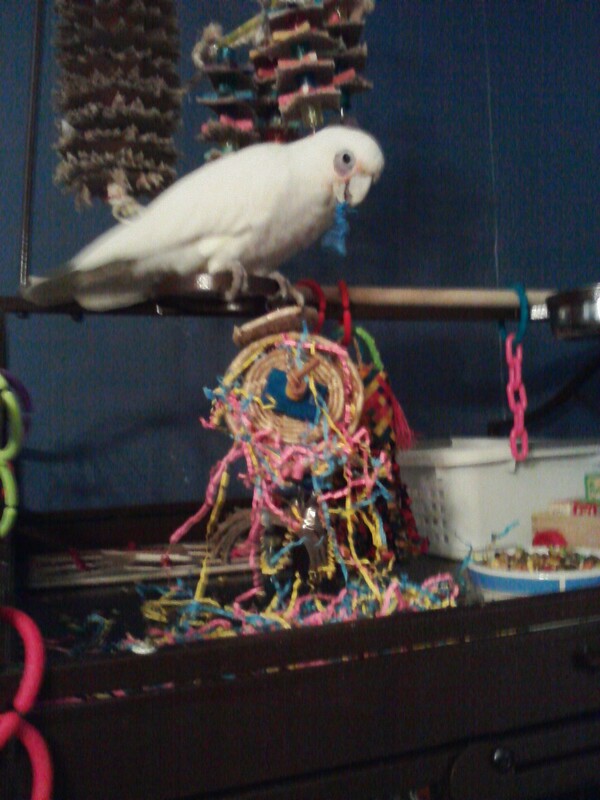 Hanging activity center appeals to your bird's love of height and enrichment. Made of a natural seagrass mat, the Super Bird Creations Flying Trapeze Platform Swing Bird Toy is a unique, fun new way to keep pet birds happily occupied. A natural platform and four anchoring points provide comfortable footing as your bird plays with an assortment of brightly colored plastic charms and beads. Great for special abled birds. Photo courtesey of Julian, an 18 Year Old African Grey, and his mom, Mia, from Pennsylvania. Mom wrote: He is a very special parrot with a bit of a rough history full of emotional neglect; he is not always interested in toys and is a plucker (I am devoted to making his life happier) but as you can see he went nuts for this toy, which also serves as a great template for making toys. This is such a winner and he gets such great exercise flapping as hard as he can while hanging upside down! Julian and I are both very happy!" A great toy for medium birds or less aggressive larger bids! A double Arch hung on wire and lots of little colored wooden blocks with heart pony beads between them and a cow bell in the middle. 24 1-14" colored blocks on this toy. 15" x 7" (total hanging length). Chock full of wood slats, wood balls and hung on chain, this toy will delight a medium size parrot or even a feisty conure or caique - and especially birds that love to play "termite"! Not recommended for aggressive chewers or larger birds. Approximately 2 dozen tightly-rolled paper sticks protrude from bottom of wooden block. The toy has wing-nut and washer attachments for cage bars.Great for Smaller birds, such as Caiques, Conures, Pionus and less destructive medium birds such as Eclectus, Greys, Goffins and similarly sized birds. Approximately 2 dozen tightly-rolled 3-1/2 inch paper sticks protrude from bottom of 1-1/2 x 2 inch wooden block. The toy has wing-nut and washer attachments for cage bars.Great for Caiques, Conures, Pionus and less destructive medium birds such as Eclectus, Greys, Goffins and similarly sized birds. 6" x 2" A small oblong shape wooden piece with mini wheels on top and bottom with a bell on the bottom and lots of little shapes hanging from the wheels with a little ring or gel shape on the end of each link. Great for Budgies to Conures. Great for the little ones. Balsa wood and beads. A nice soft wood for those little beaks. A seagrass mat stuffed full of fun! Adorned with wood slats, bagels and wood balls .Fabulous for foraging. Great for medium birds. This one is a sure winner! 8" long x 18" wide (including palm stuffing). Actual mat is approximately 10" long. This Activity Wall is an awesome seagrass mat that hangs from the top of your cage or even on the side. Adorned with wicker, bagels and wood., Great exercise as a climber, too! Recommended for Small to Medium birds. 12" x 14"
This Foraging Pouch is a seagrass mat that hangs from the top of your cage or even on the side. Filled with fun foraging paper, but feel free to add to the fun with treats, wood, etc. Great exercise when used as a climber, too! Recommended for Medium to Large birds. 14" x 16"
Fun for smaller birds, from lovebirds to conures! Video courtesy of River, a Green Cheek Conure, and his mom and dad, Gretchen and Lance, in Pennsylvania. Great for Small to Medium birds. 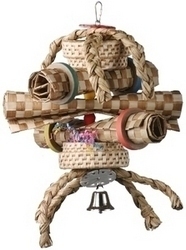 Sturdy wicker basket filled with a huge variety of shredable materials, including wooden popsicle sticks, ice cream spoons, woven grass mat & spiral roll, mini loofahs, paper fingers, corrugated paper, plastic coils & a variety of colorful beads and rings. NEW! A cute wood bee decorated with rows upon rows of balsa wood slats. Great for Conures, Caiques, Pionus and similarly sized birds. 9" x 4"
Video courtesy of Blueberry, a budgie, and her mom, Margaret, from Illinois. 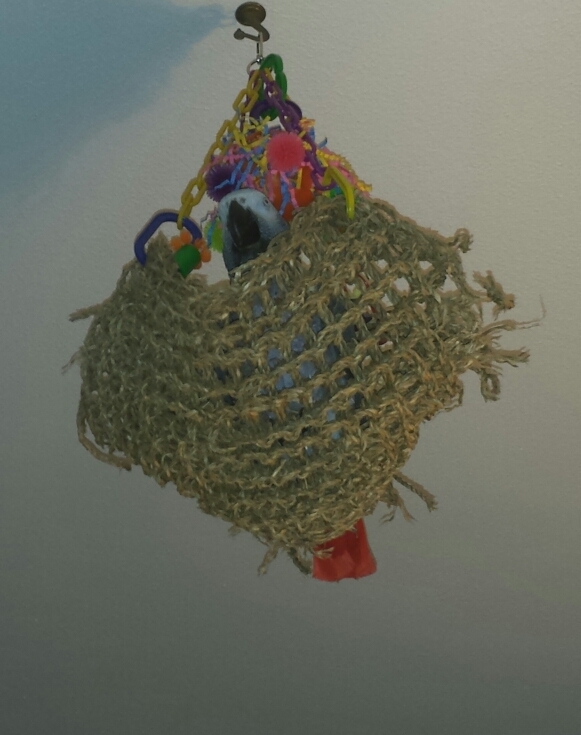 Great for small to medium birds, this toy provides lots of fun! Hangs from side to side, or make it into a swing! Wood, chain and fun! Many colored wooden slats and natural munch balls held together with a wicker star at the top. Great for foraging, too! This perch with tons of activity attaches to the side of your cage. A sure winner. Perch is made of natural wood. The perch has a 1" diameter and is 7 inches long. A great shreddable toy for small to medium birds.Woven maize disks adorned with wooden parts & crinkle paper. Hide some of their favorite treats in the paper behind the maize disks.